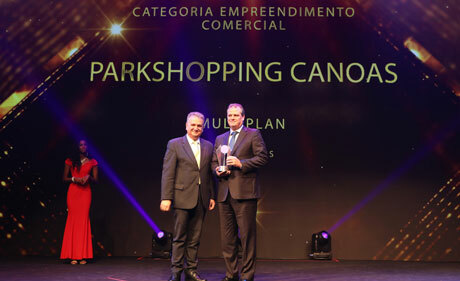 ParkShopping Canoas was the winner of the 24th Master Real Estate Prize, in the Commercial Development category. Multiplan's 19th mall was recognized for its modern design, forming a project that is sustainable and integrated with nature. The Master Real Estate Prize, created in 1994 by Fiabci-Brasil (Brazilian Chapter of the International Federation of Real Estate Professions) and Secovi-SP (Union of São Paulo Commercial, Residential and Commercial Property Purchase and Sale Companies) was inspired by the concepts and criteria of the Prix d'Excellence, through FIABCI Mundial during its annual Congress and considered one of the most important international awards in the real estate industry. At each edition, the directors of Fiabci-Brasil and Secovi-SP aim to recognize and stimulate professional excellence in the Brazilian real estate sector, conferring awards and annually disseminating the performance of companies and professionals who are most distinguished, according to the choices made by a judging committee made up of specialists, thus promoting the improvement and modernization of the sector. The FIABCI-BRAZIL presidents, Rodrigo Luna, and Secovi-SP, Flavio Amary, opened the ceremony, offering a message of optimism and hope. "The Real Estate Master is a valuable source of inspiration for projects and policies that foster Brazil's economic and social growth. Even in the face of crisis and instability, real estate developers continue to seek the excellence of their products and services," said the leaders.